Étienne Beudant trotting backwards on Robertsart II. – Sidney Felton, Masters of Equitation, 1962. While it is unlikely that Baucher, renowned circus écuyer and dressage master, never rode outside the enclosed school, indoors or out, he clearly made his teaching home and his formidable reputation in the manège. The English-born French master James Fillis (1834-1913) — student of Baucher, contemporary of Faverot, and author of Principes de dressage et d’équitation (1890), titled Breaking and Riding in English — went farther afield: as W. Sidney Felton notes, “although … Fillis was interested primarily in school riding, he [taught outdoor riding to a slight extent], and he even had some comments to offer on jumping.” Kerbrecht and Beudant went farther still in taking the theory and practice of Baucherism outdoors — across country and over fences for battle and sport alike. Though the lessons themselves defy brief summary, a few of their basic principles warrant mention. Faverot teaches that lightness must be a “constant preoccupation,”straightness an “object of constant care,” and self-carriage an essential goal; teaches that application of tact and finesse rivals application of theory or system; and teaches, to cite two specific Baucherist axioms, 1) the importance of leg without hand, hand without leg (“if the leg and the hand act simultaneously, their effects tend to annul each other and produce contractions”), and 2) the priority of position over movement (“give the position which should cause the movement, and do not look for the movement which must be a consequence of the position”) — the reason behind Baucher’s predilection for the walk as a training gait. Frontispiece of Faverot’s Cheval de Selle. 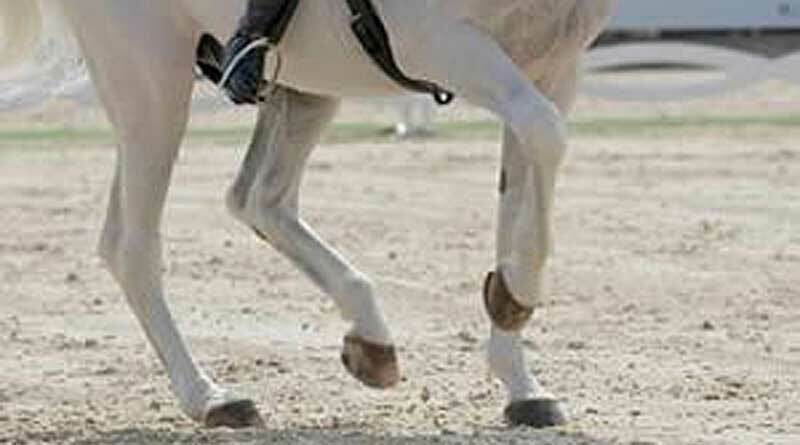 Though little in Methodical Dressage applies specifically to training the outdoor horse (a particular “method of obtaining the canter,” for example, “above all finds its application in outdoor equitation”), very little cannot be applied: work in hand, Faverot notes, can hold value for a hunter — likewise rassembler for an army horse, and, more obviously, “turns by the pressure of the reins … to the military rider who conducts his horse with only one hand” (the other wielding saber or lance). The trainer must distinguish what is necessary for a horse “specifically destined to the outdoors,” as opposed to one being prepared for “higher equitation” — a distinction Faverot later explored in a pithy text (included in this edition), Dressage du cheval de dehors, conseilsdonnés aux membres de l’Étrier (Dressage of the Outdoor Horse, Advice Given to Members of [“the Stirrup” Riding Club], Recalled by one of [Faverot’s] students, General George de Lagarenne) (1907). Étienne Beudant’s elegant treatise, Horse Training: Outdoors and High School, shifts the emphasis from school to outdoor training. More fluid than Methodical Dressage in structure and style, Outdoors and High School opens with Beudant’s fully developed thoughts on Horse Training and Methods and on Hands without Legs, Legs without Hands (accorded pride of place here), and then offers lucid definitions of 13 terms — some in one or two sentences, others in one or two pages, all more expressive than technical: “Tact: The genius of equitation — the feel of the horse.” After wending through ample discussions of topics including Lightness, Progression of Dressage, Obedience to the Spur, Ramener and Rassembler, Work at the Canter, Jumping, and so on, the book closes with Results of Training, comprising instructive précison the training of many of Beudant’s horses (notably, the exceptionally gifted Robersart II and the exceptionally timid Mimoun). More attuned to philosophy than to technique (though excelling at both), Beudant also develop themes rather than expounds principles. His primary theme holds that the horse should be “as supple and brilliant under saddle as at liberty” (the word appears often), and that the rider, therefore, “must reduce his actions to the very minimum and leave the horse the greatest possible freedom in his” — particularly outdoors, where the horse’s instinct “serves him infinitely better than he could be served by even the most skilled rider.” Communication is the key. Intelligent and willing, the horse “habitually responds logically to demands made upon him,” and “almost always … tries his best to respond to orders.” When communication fails, “the fault is nearly always with the rider.” Consequently, the rider’s task and responsibility is “to observe and to reflect” — to observe the horse at liberty and to reflect on his own, not his mount’s, errors. Étienne Beudant and Robertsart II. Beudant gives this fundamentally romantic view, derived from Baucher’s rejection of classicism, a modern twist. He derides “the emptiness of theories and scientific formulae for the training of a riding horse,” and excoriates “experts of the different schools of training” and their “learned demonstrations” for promulgating “complicated principles [for airs that] do not teach us how to take our horse where we wish, when we wish, as we wish.” Since the horse (“that valiant creature”) is not a “soulless machine,” these “calculations in mechanics” only reflect and further encourage “the pretensions of those who … believe that they can manage and care for a horse as a mechanic guides and repairs a motor car.” Proper dressage, instead, relies on tact and passion: “The understanding of a horseman comes from his heart, not from mathematical calculations. Why then try to make of his noble comrade a mere automaton?” In short, abstruse theories that communicate poorly with riders produce inept riders who communicate poorly with horses. Outdoors and High School, finally, has a marked elegiac quality. Beudant opens his dedicatory letter by recalling that its addressee, General Juinot-Gambetta, had promised at the beginning of the war “to send me to the great battle-front,” but that a subsequent, and severe, riding accident had precluded that service. “Pain, only pain which never quits me,” Beudant recalls his emotion, “mitigates the bitterness of my inaction. All is over for me — no more the joy of equitation.” Extending the theme in the opening of his text proper — “I studied solely the training of the riding horse,” a horse soldier “unable to march to victory, as did real horsemen” — he concludes it chapters later: “Now I ride Mimoun on solitary quiet rides … dreaming, with sadness, of hopes blasted and gone awry. Once I anticipated ending my days with the Cavalry among horsemen and beautiful horses.” A common theme in Great War literature, injury and inability to perform mean loss of futurity, potency, and love. Classic works of dressage and equitation for manège and field, written by two brilliant horsemen, Methodical Dressage and Outdoors and High School offer contemporary equestrians of all disciplines invaluable lessons in equestrian history, theory, and practice. Equally committed to Baucherism for training and riding horses, the two books differ in how they translate that commitment: a sometimes dry technical treatise, Methodical Dressage is informative, practical, and directly useful; a more deeply felt meditation, Outdoors and High School is evocative, eloquent, and often inspiring. Separated by three decades that witnessed the Great War, social and political upheavals, and profound revolutions in culture and thought, Methodical Dressage feels Victorian in sensibility, Outdoors and High School modern. The former speaks to us, the latter with us. Charles Caramello is John H. Daniels Fellow at the National Sporting Library and Museum in Middleburg, Virginia, and Professor of English at University of Maryland.